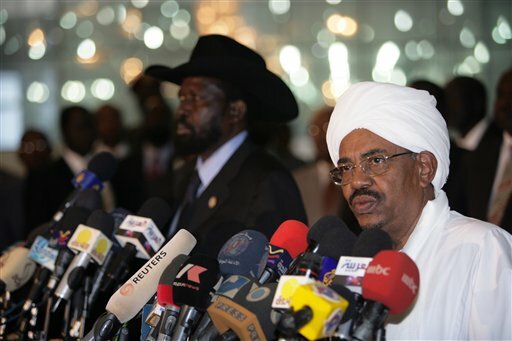 ADDIS ABABA, Ethiopia – A summit between Sudanese President Omar al-Bashir and South Sudanese President Salva Kiir has yet to secure an agreement on a number of tinderbox issues between the two countries. The top-level meeting, which officially began today in the Ethiopian capital, is taking place two days after the September 22 deadline that the African Union established for the conclusion of negotiations between Sudan and South Sudan. The highly anticipated presidential summit follows three weeks of non-stop negotiations between the two sides. It is meant to conclude with the signing of a comprehensive deal to address all of the outstanding issues resulting from South Sudan’s separation. A number of key issues currently stand between the two sides, including security arrangements along the North-South border, the details of a referendum vote that would decide the final status of Abyei, and a number of smaller oil-related issues. In the previous round of negotiations, Sudan and South Sudan provisionally reached agreement on a financial package that includes agreement on oil transit fees. However, this deal will not hold unless it is part of a larger comprehensive deal that addresses all unresolved issues, both Sudanese and South Sudanese representatives have said. Of the issues that remain, the final status of Abyei presents the biggest impasse. An African Union-drafted proposal calls for a referendum on the contested border area’s final status to be held by October 2013. The 2005 Comprehensive Peace Agreement provided for a referendum on the status of Abyei to be held by January 9, 2011, but this vote never took place due to disagreement between the two sides over the voter eligibility requirement. According to Sudan Tribune, the latest position from the A.U. proposes that the Ngok Dinka community as a whole and “other Sudanese residing in the Abyei area” are entitled to a vote. The definition of residency for those who are not Ngok Dinka are those with a “permanent abode” in the Abyei area, the Sudan Tribune said. Thus far, the South Sudanese team has responded to the Abyei proposal much more positively than the Sudanese delegation. A second impasse remains over the disputed territory between South Sudan’s Northern Bahr el Ghazal state and Darfur known colloquially as “14-miles”—the 14 mile-wide strip of disputed territory between the two countries—and arrangements to demilitarize this area. U.N. Security Council Resolution 2046 calls on Juba and Khartoum to unconditionally accept the A.U. map that establishes the centerline from which a demilitarized zone between the two countries would be drawn. Khartoum has rejected this map since its presentation in November 2011. In this final round, the two parties have engaged in negotiations over the special arrangements for the 14-mile area. One of the economic issues remaining is the government of Sudan's claim that South Sudan expropriated $1.2 billion worth of property owned by Sudapet, Sudan's state-owned oil company. Negotiations look to continue late into the night in Addis Ababa. Stay tuned.